Automatic Routing works best for customers who do not want to worry about checking their tanks propane level. Instead, Signature Propane schedules your deliveries for you. We periodically stop by and check your tank’s gauge, when it can take approximately 100 gallons or more we ‘automatically’ top your tank off. The automatic route delivery schedule is tailored to each household. 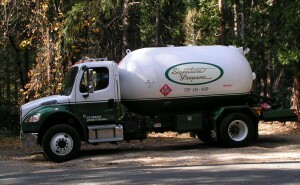 We will use your history of propane usage to determine how often we come by to check your tank. In the winter it is not uncommon to receive a delivery every four to six weeks. As the weather warms up we come by less often, most households need only one delivery in the summer. We guarantee you will not run out of propane (a huge relief in the winter months!). If there is a change in your usage, for instance an addition of a gas appliance, (i.e. pool heater, gas fire place, etc.) you MUST notify the office so we can schedule your deliveries efficiently. * If your account balance is past due and you run out of gas you will need to make delivery arrangements with the office. Also, the on-call driver will not deliver to past due accounts after hours. ** There are occasions when the .05 discount does not apply, such as when we run the Summer Special.